THERMOFLOC loose cellulose insulation made from recycled newspaper. Combined with a mineral fire retardant, it offers sustainable and cost effective roof or floor insulation. 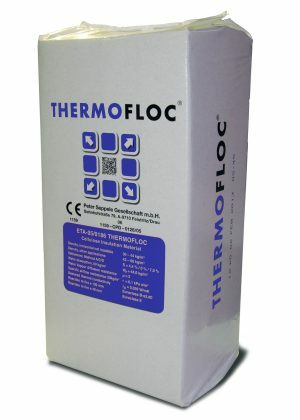 Thermofloc is efficient, sustainable and cost effective. For these reasons, more and more professionals and end users are making Thermofloc their choice of insulation. Suitable for old and new buildings, it helps to create a comfortable indoor environment all year round. In addition this helps to reduce heating costs. Installed as a loose fibre insulation, it easily fills voids. What’s more, with an installed density of 40 kg/m³, it also helps with sound reduction in the property. Thermofloc cellulose insulation was developed more than 20 years ago is now one of Europe’s leading brands of sustainable insulation. Supplied in 12 kg bags. Simply break the material up into a light fluffy consistency and pour evenly to the desired thickness. Spread to form a level surface. Material consumption is approx. 40 kg/m³ or 4 kg/m² per 100 mm of thickness. Install by hand and use to insulate horizontal spaces (lofts and between floor joists). 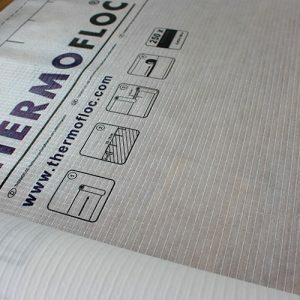 Thermofloc insulation is made of unmixed newspaper with the addition of minerals for preservation and fire protection. The paper is shredded coarsely and then processed into fine, elastic cellulose fibres in a fibre mill. The finished product is packed into bags. Certified quality control guarantees that the product meets the highest European requirements. Documented by European Technical Approval ETA-05/186. Awarded the coveted Natureplus® mark – the first cellulose insulation product in Europe to do so. The Natureplus® independent panel evaluated the environmental, health and technical properties of Thermofloc insulation. Thermofloc helps prevent the emission of harmful gases within the building fabric. This therefore reduces the consumption of fossil energy sources. What’s more, these strict limits ensure that no adverse effects on health come from cellulose insulation. The Natureplus® mark also backs up the durability and long life of the insulation.